Nahum is a prophet with a small three chapter writing that gloats and rejoices over the destruction of an Assyrian city called Nineveh. The Assyrians were a particularly savage nation that Nahum indicates has fallen because it is being repaid for their evil treatment of captured nations. Nahum predicts the fall of Nineveh acknowledging it is entirely the work of the Lord. Then he writes about the attack and defeat telling the citizens of Nineveh that they should confess that it was all the Lord’s doing. This poem has two underlying themes; God’s sovereignty over all people, and his special providence towards chosen people. The opening is a typical hymn in praise of God. It describes the Lord as jealous and avenging, revealing him through elements, wind, storm, clouds, describing Him as goodness, protectiveness and mercy and it closes underscoring God’s power to judge and punish. The quoted verse describes God as goodness and protection for those who trust Him and destroyer of their enemies. The Lord will always take care of and protect those who rely on Him. The story or Nineveh and God’s protection of the people is typical of how the nation of Israel saw their relationship with God. This describes old covenant relationship between God and the nation. Today new covenant relationship applies protection to individuals, each of us who are disciples of Jesus. We become God’s chosen and protected, once we accept God’s support. God chooses us and we choose God. It is the relationship Jesus has come to define and lead us to. If God is willing to destroy enemy cities, how much will he do for each of us? 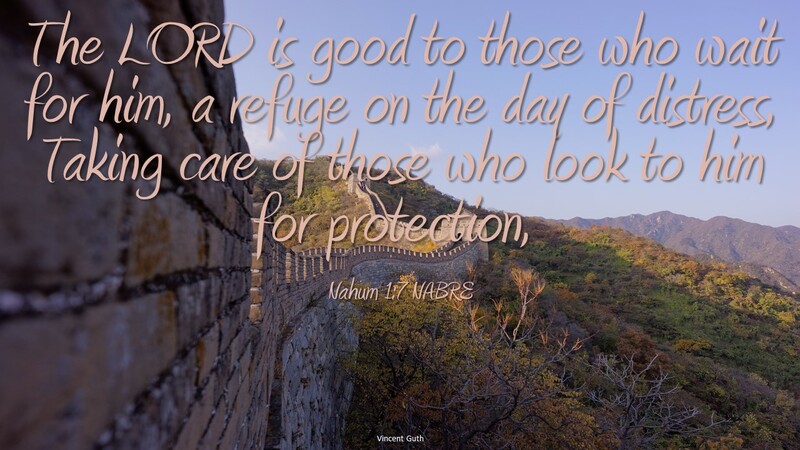 Do you rely on God’s protection? How do you accept being the chosen of God?